Once assessment results have been uploaded into SchoolCity Suite, either by scanning, GradeCam™, or online administration, the data can be viewed in a variety of ways. 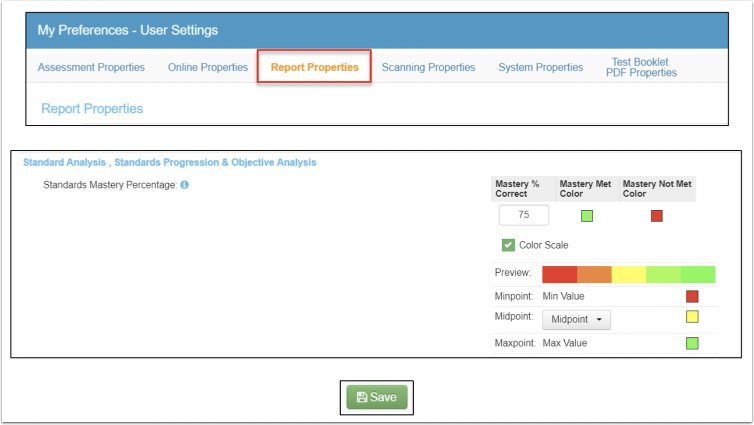 One of the Predefined Reports in SchoolCity Suite is the Objective Analysis Report. 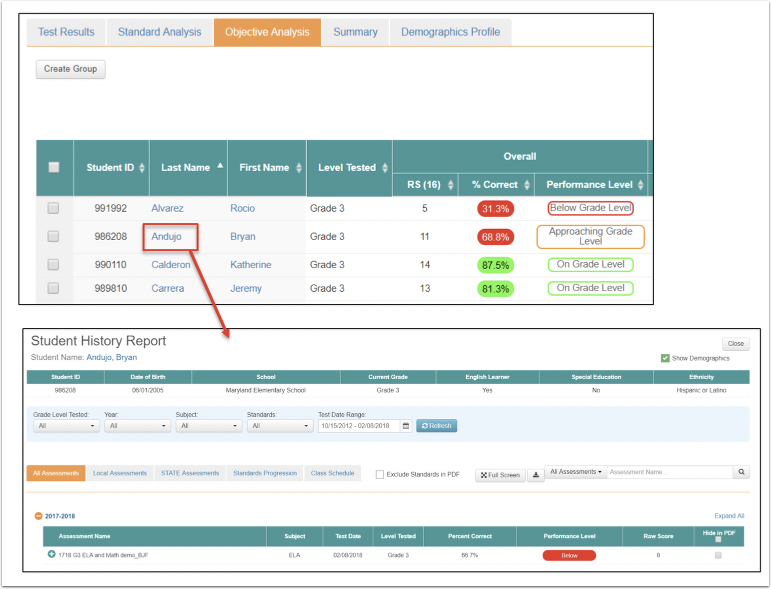 The Objective Analysis Report displays student level data by individual objective for the selected assessment. It is specifically designed to be used with Performance Based (A+) Assessments and other assessment types that include assessment objectives or sub scores. The default setting shows the list of Predefined Reports under the orange tab (1b). Click on Objective Analysis in blue or on the view icon (eye) to the far right to go to the report (1c). Note the descriptor statement for this report. Color Scale: View the student data with a color scale as set in District Defaults or My Preferences. Mastery/Non Mastery threshold: Select to view one or both Mastery/Non Mastery threshold. Student results: ID #, Name, Level Tested, Overall: Raw Score, % Correct, and Performance Level; Individual Objectives scores: Objective Title, Raw Score (total possible), % Correct, and Performance Level. 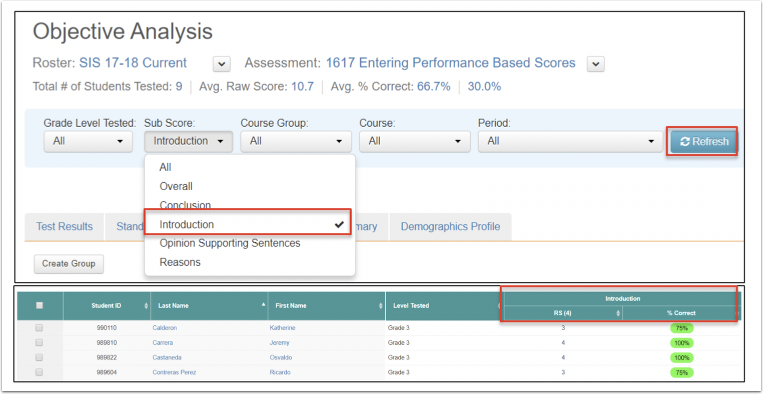 Note: Score Labels, Score Types, Performance Levels, and Objectives are set by the assessment creator based on the specific Performance Task administered to students, and may vary from what is shown. In this example, there is an Overall Score with Raw Score (RS) (total points), % Correct, and Performance Level. Note: The Overall Score can be automatically calculated if each objective has the same Score Label such as “Raw Score”, and a Score Type of “Numeric”. There are three assessment Objectives (Sub Scores), as set by the assessment creator, each scored separately using a 4-point rubric (for a total Raw Score of 12). Each Objective displays the Raw Score (RS), % Correct, and Performance Level by student. The color coding for % Correct indicates whether the student has met the Mastery Threshold for each objective as set in District Defaults or, if not set and locked, in My Preferences. Green indicates the student has mastered the objective; red indicates the student has not mastered the objective. Use the Sub Score drop down list to view results of each objective separately. Click Refresh to view the results. Students are listed alphabetically by default, but each column can be reordered by clicking on the column headers, or on the up/down arrows. In the example shown, the students have been reordered from lowest to highest by Percent Correct for the Overall Score. Clicking on the header again will reorder the students from highest to lowest. Create Group: A student group can be created by checking the box next to selected students. Click Save in the confirmation message. In the User Menu Bar, click on the down arrow next to your role in parentheses. Scroll down to the Standards Mastery Percentage section. If the percentage is not locked by the District, you may change it. This is also where the Color Scale can be set. Click on Save to save any changes you have made.